Stephen Colbert Will Have A Cameo in Peter Jackson’s ‘The Hobbit’!!! The host of Comedy Central’s ‘Colbert Report’, Stephen Colbert has been a huge fan of J.R.R. Tolkien and his work for a long time. 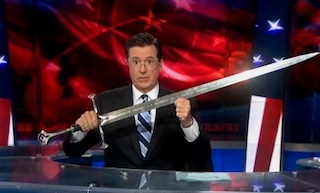 Colbert has mentioned his fandom about Tolkien’s works on his Comedy Central show for years now. Well, it looks like Mr. Peter Jackson has made one of his dreams come true. A source close to the project has confirmed that Jackson has added Mr. Colbert to the film trilogy, however it won’t be the upcoming ‘The Hobbit: An Unexpected Journey’, which is set to release December 14 of this year. That’s pretty cool. Jackson is know to do this with people visiting the set. And if you remember, this is how Samuel L. Jackson got his role as Mace Windu in the ‘Star Wars’ prequels. Jackson was on a talk show and he was asked if he could be in one movie, which one would he want to be in. He responded with ‘Star Wars’. So, a little while later, George Lucas wrote Mace Windu for Jackson and the rest if terrible history. So, Colbert will not be in the up coming film, but will most likely be in the following two films of the series, ‘Desolation of Smaug’ releasing December 13, 2013, and ‘There and Back Again’, which will release July 18th, 2014. Can’t wait to see these and see if Mr. Jackson comes on the Colbert Report and confirms. The Follow-Up Film to ‘Desolation of Smaug’ Has Been Renamed!!! This entry was posted on Sunday, October 21st, 2012 at 11:30 am	and is filed under Film, News. You can follow any responses to this entry through the RSS 2.0 feed. You can skip to the end and leave a response. Pinging is currently not allowed. « Film Review: ‘Paranormal Activity 4’!!! Why don't you sit down. She's dead. She was killed. I'm sorry. I knew it was going to end this way. It was always going to end this way. And how did she die? She was shot. We were together in India. He came for me. [after a long pause] Yes. Someone started all this, and I'm going to find them.